“When u appropriate black features and culture but fail to use ur position of power to help black Americans by directing attention towards ur wigs instead of police brutality or racism #whitegirlsdoitbetter,” posted Ms. Stenberg. When I first heard about the incident, I wasn’t sure how I felt about it because I didn’t know all of the details (and still don’t). In my opinion, cultural appropriation is not a light accusation to make, specifically because it suggests racist motives behind a person’s behaviour. Furthermore, I believe that cultural appropriation depends on the context of the situation. In the case of Ms. Jenner, at first glance, it seemed like she just wanted to try out something new with her hair, and, like the author of this recent article in The Guardian, I don’t see anything wrong with that. However, by using the caption, “I woke up like disss”, not to mention posting a video tutorial the day before on how to wrap your hair at night, I can see how Ms. Stenberg may have felt like this youngest member of the Kardashian clan was making a mockery of Black hair practices, rather than genuinely celebrating them. But it all depends on Ms. Jenner’s motives; and it’s up to her to shed light on them. Is it cultural appropriation when a White woman wears cornrows? 1) Are the braids being worn simply as a styling choice; or is the wearer playing “dress-up”, and, in essence, mocking the Black experience? 2) Does the wearer recognize the political and/or historical connotations of her hairstyle choice? And does she even care? Are the braids simply a styling choice; or is the wearer playing “dress-up”, and, in essence, mocking the Black experience? I personally don’t believe that there is anything wrong with people from non-Black cultures wearing braided hairstyles (i.e. braids, cornrows, locks, bantu knots, etc.) Why? Because hair braiding is a human practice—not a “Black” one—braids have been worn by people of all ethnicities for thousands of years, and is therefore not specific to African people or those of African descent. Through my Watson Fellowship research project, “Braiding: Traditional Art, Esthetic Service or Cultural Expression?” as well as subsequent research, I discovered that people in all societies around the world have braided their hair for various reasons: whether cultural, spiritual, political, historical, or practical reasons, as well as purely aesthetic reasons. This is precisely why I believe that braided hairstyles should not be frowned upon in society, but rather be recognized as a human art form. As we know, due to historical, practical and political reasons, what I call “stylized braiding” (i.e. braids, cornrows, locks, bantu knots, etc.) has become synonymous with Black culture. That being said, I think it would be unfair to say that anytime a White person decides to wear a braided style that s/he is trying to appropriate Black culture. If that were the case, many of us, Black or otherwise, would also be guilty of appropriating Native American/Aboriginal culture when we choose to wear our hair in mohawks, fro-hawks, and faux-hawks, for instance. I believe that the difference between cultural appropriation and cultural exchange really boils down to the context of and the impetus for the style choice. As Ms. Stenberg, herself, eloquently pointed out in her video commentary, “Don’t Cash Crop My Cornrows”, the line between cultural appropriation and cultural exchange is often blurred. And I think when it comes to hair, in particular, it’s not so black-and-white (pun intended), since no one can really claim ownership per se of styling techniques. So, if a White woman gets cornrows because she wants to change her hairstyle, or because she thinks they look good, or because she wants to keep her hair off of her face—why not? Now, if she’s decides to wear cornrows because she’s trying to be “down” with Black culture, or trying to “look Black”, and is, in essence making fun of the Black experience, that’s a different story–I think that’s where it becomes appropriation. Does the wearer recognize the political and/or historical connotations of her hairstyle choice? Does she even care? I know some of you are probably wondering why this question is even relevant, thinking to yourself, “What’s the big deal? Aren’t cornrows just a hairstyle?” In a more perfect world, yes, cornrows would just be a hairdo. Sadly, in the world we live in, it’s not just a hairdo for Black people. Since stylized braiding is so prevalent in African/Black culture, society views them as a “Black” practice; and since Black hair (as an extension of Black bodies) is politicized, so are “Black” hairstyles. As a result, hairdos like cornrows are not simply a styling option for Black people: rather they have become politicized symbols of “Blackness”, whether we like it or not. For this reason, when a White person wears a “Black” hairstyle, like cornrows, and does so flippantly, it is viewed as appropriation, and is thus offensive, because when a Black person wears the same hairstyle, it comes with an imposed societal burden. That being said, is it cultural appropriation when a White woman wears cornrows? Not always. Does wearing a Black hairstyle mean that one must support Black causes. I would have to disagree with Ms. Stenberg, here. Just because someone chooses to wear a Black style doesn’t necessarily mean that they should also be an advocate for Black people–even if the wearer understands the connotations of the style itself doesn’t mean that they have an understanding of what it means to Black. However, I do think that when one engages in cultural exchange, such as wearing an “ethnic” hairstyle or “ethnic” clothing, one should at least demonstrate an appreciation and respect of the culture from which you are borrowing. The problem is the age-old double standard: when White women wear braided styles, they can make light of it; yet, more often than not, Black women do not enjoy that same luxury. And things haven’t changed much. The negative reaction to the ease with which Kylie Jenner can wear her cornrows is reminiscent of the sentiments that Black people felt in the 70s when cornrows became acceptable only after Bo Derek (a White actress) wore them in the movie “10”…when Black people had been wearing them for centuries! 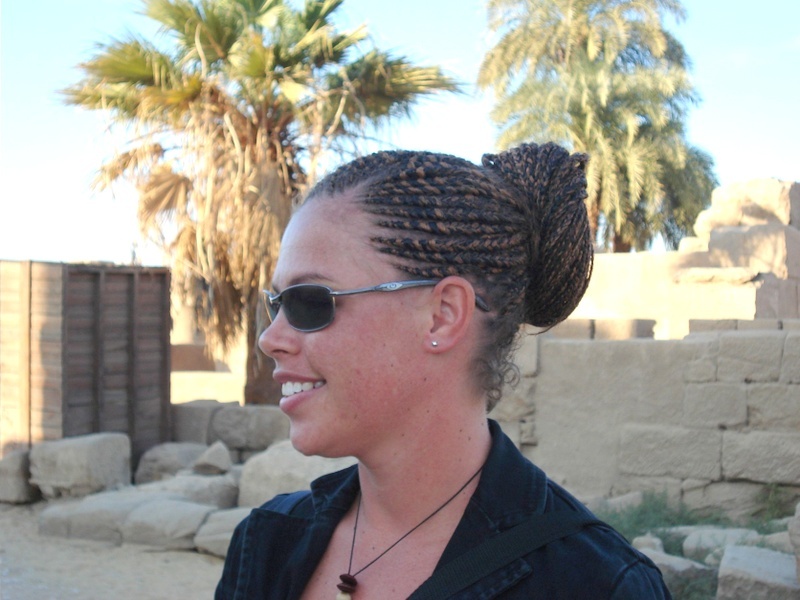 When a White woman decides to wear cornrows, it is seen as fashionable; yet when Black women wear the same hairstyle, it is deemed as questionable. Why is it that society praises White women when they wear braided styles, yet when Black women wear them, we have to think twice? What are your thoughts? Is it wrong for White women to wear cornrows or other “Black” hairstyles? This is an excellent commentary on appropriation of raciallized culture by a dominant culture. It is a bit insulting when the main group can either be appreciated for wearing a style frowned on when worn by a specific group, or they use the style in a derogatory way to poke fun at others. However, it is important to be clear on what the person or persons’ intent is. I agree, style, fashion, culture has difficulty remaining strictly available to any one group in our gobal village. Hopefully, these conversations will help us understand better the complexities of culture and appropriation. Thanks for your comment, W.J. I agree with you: I think it is important for us to have these types of conversations because many times the lines of appropriation are crossed unintentionally simply due to a lack of awareness or understanding. I think the more that we discuss these sorts of issues, there will be more efforts made towards sensitivity; and, as a result, less offence caused. I was just looking through iconic haircut colors and styles. And glanced over this article. Be your own kind of beautiful and anyway you want to wear your hair is fine if that’s what you like. Copying is a form of flattery and any style that you choose is your self identification right wrong or indifferent. Why does it have to be a racial thing. I think we need to look at the heart rather than the hairstyle when we say things or judge like that. I mean if we really want to look at it wouldn’t some people say that Michelle Obama is wearing a white person hair style.? oh my gosh this is just so much judgement… After all it’s only hair. and not that I need to explain I just rambled on and there may be some typos in here but that will give everyone something to do to … going on and judging everyone else instead of looking at themselves. Thanks for stopping by, Kay, and for your comment. In a more perfect world, hair would “just be” hair, and wearing styles from other peoples would simply be “copying”. Sadly, however, we live in a world in which a beauty double standard exists, where a White/European aesthetic is considered the norm, and the value and the suitability of all other aesthetics are gauged based on that standard. Moreover, due to racism throughout history, Black hair (and bodies) and hairstyles, in particular have been politicized. As a result of the double standard, when Black hairstyles have been worn by Black people, such styles have been deemed to be socially unacceptable, professionally inappropriate, too urban, ugly, etc; yet, when they are worn by White people, the same hairstyles are glorified as chic, cool or trendsetting. Herein lies the problem. Until the playing field as it relates to aesthetics has been levelled, Michelle Obama’s hairstyle is less about choice than it is about conforming; and Kylie Jenner’s facility in wearing cornrows is less about preference and more about privilege.